Water stress, which is pressure on the quantity and quality of water resources, exists in many places throughout Europe, resulting in serious problems of water shortages, flooding, pollution and ecosystem damage. Although there has been much improvement in water quality since the first European law on bathing water twenty years ago, there has been little progress on the integrated management of water resources, which is the most effective way to address water issues. It is now recognised that most of the 20 or so European laws on water need to be harmonised, updated and integrated so that the links between the quality and quantity of water can be better managed. However, there is wide variability in the supply and use of water by different economic sectors, across the diverse geographical areas of Europe. This makes political agreement on priorities difficult to achieve without improved information and understanding, particularly about the linkages between the quality and quantity of water and about the impacts of water use on other users and countries. The main problems concerning water quantity and quality are summarised below. Water resources vary widely across Europe (Map 1). Renewable freshwater resources available for use in a country is the amount of water moving in rivers and aquifers, originating either from local precipitation over the country itself, or by water received from neighbouring countries in transboundary rivers and aquifers. 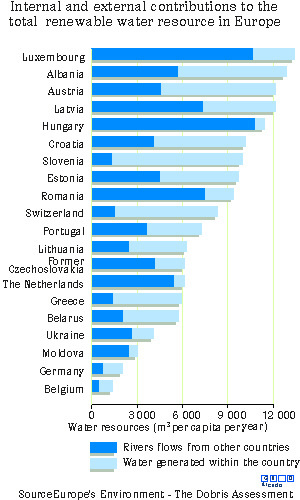 One third of European countries have relatively low availability of water, i.e. less than 5000 cubic metres of water per head per year (Table 1). Southern countries are particularly affected, with Malta having only 100 m3/head/year, but heavily populated countries of northern Europe with moderate rainfall also come within the low availability group, such as Belgium, Denmark and the UK. The demand for water is generally increasing, particularly in Southern countries, and especially from agriculture, though industry remains the major user of water in Europe. (For Europe as a whole, 53 per cent of abstracted water is for industry, 26 per cent is for agriculture and 19 per cent for household use but with wide variations between countries - Figure 1). This increasing demand for water is leading to a switch in approach from just increasing its supply, through reservoirs etc, to demand side management, which focuses on the more efficient use of water by reducing losses, less wasteful use of water, more efficient appliances and water recycling. In many cases it is cheaper and more effective to improve water use efficiency than it is to increase water supplies. 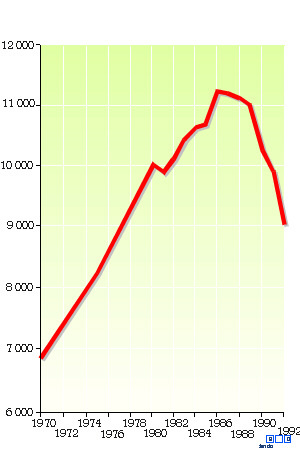 For example, water efficiency measures reduced the consumption of water in Madrid by 25 per cent between 1992 and 1994. This is the equivalent to a reservoir providing over 100 million m3 of water per year. The use of 6 litre toilet water flushes in the UK, rather than the usual 9 litres, would save 10 per cent of the UKs household water use, according to a recent estimate. Reliable data on water use efficiencies by economic sector and European country are unfortunately not yet available but large differences in use efficiencies are likely. The collection and exchange of this information will help to achieve more efficient water use across Europe. The intensity of water use, which is the percentage abstraction of water resources available from within the country and from transboundary rivers, varies widely from 0.1 per cent for Iceland to 72 per cent for Belgium, with an average of 15 per cent for Europe. In some countries, however, their use of just internal water supplies is very high, as in The Netherlands, Belgium, Portugal, Hungary, and the Ukraine, where dependence on transboundary rivers is therefore also high (Table 2). Note: Indicators are calculated as the country's water abstraction in percentage of (a) total available resources and (b) internally generated water resources. Some 20 European countries depend on other countries for more than 10 per cent of their water resources, with 5 countries relying on over 75 per cent of their resources coming from abroad via rivers - The Netherlands, Hungary, Moldova, Romania, and Luxembourg (Figure 2). This reliance on transboundary rivers can lead to tensions between countries especially where total water availability in the upstream country is less than in the downstream country. For example, Spain has only one third of the water availability per person than that of Portugal, which receives 48 per cent of its water resources from the transboundary rivers of Spain. 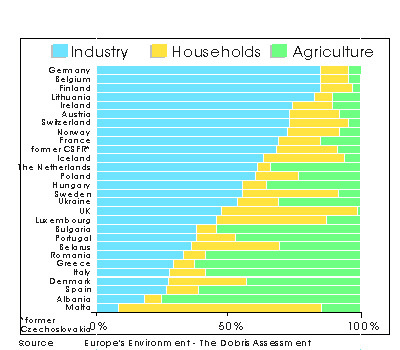 Source: Figure 5.4 Europe's Environment - The Dobris Assessment. Unsustainable use of water is the withdrawal of water from natural resources at a rate faster than it can be replenished by nature. About 60 per cent of large (over 100,000 inhabitants) European cities have 140 million people living in or near areas of such groundwater over-exploitation. This can lead to restrictions on water use by both households and industry, as in Greece, Spain, the UK and other countries recently, and to other problems, such as the loss of wetlands, desertification, low river flow, and the intrusion of salt water into coastal aquifers. Two-thirds of people in Europe rely on ground-water for their supplies of drinking and other water needs - a hidden, yet precious stock that once polluted or depleted, is expensive and time consuming (i.e. a matter of decades) to restore. Whilst money is spent reducing the concentration of pesticides and nitrates in drinking water supplies, resources are also expended using such chemicals on farmland - one example of the links between different parts of the water cycle which dictates the need for more integrated approaches. In many parts of Europe the price of water used by industry, agriculture and households is either subsidised or is much less than the total cost of supplying and using it. This encourages inefficient water use. New incentives and pricing structures for water are being considered in order to achieve the use efficiencies needed to avoid water stress. For example, the full costs of applying pesticides and fertilisers to agricultural land would need to be included in their prices if overall economic efficiency is to be achieved. On the supply side, drinking water losses from the distribution system are estimated to amount to an average of around 30 per cent in most countries. In urban areas, leakage is substantially higher, reaching 70 to 80 per cent in some cities. Finding and repairing leaks is costly, and since the losses do not translate into higher water prices, thereby remaining unnoticed by the public, suppliers are often reluctant to spend money dealing with this problem. Yet the cost of unchecked water leakage also has a price, estimated to cost the UNECE region as a whole some ECU 8 billion a year. New efforts on leakage repair and management are now underway. Losses in other sectors are also thought to be high. For example, it is reported that in Portugal around a half of the water used in agriculture (representing 50 per cent of total water abstractions in that country) is used inefficiently, representing a 50 per cent loss. Losses in its industrial sector are around 30-40 per cent. The over use of water is also contributing to the loss of Europes wetlands. 50 per cent have disappeared in recent years and drainage and excessive abstraction threaten 25 per cent of remaining wetlands. Wetlands are valuable because of their flood buffering and water filtering capacities, their biodiversity, and their potential contribution to drinking water supplies. Water shortages and restrictions on industrial and other uses are already occurring in many parts of Europe as a result of the above pressures on water supply. For example, river basin authorities are increasingly restricting the rights of industry to abstract water and similar pressures on agriculture are likely in the near future. Future water supplies may also be adversely affected by climate change. Potential climate change resulting from anthropogenic emissions of carbon dioxide and other greenhouse gases is a major environmental issue. The latest assessment of the Intergovernmental Panel on Climate Change (IPCC) in 1995 is that the balance of evidence suggests a discernible human influence on global climate. Climate change is expected to increase global mean sea levels, with some levels in Europe rising and some possibly falling, according to some studies; to change the run-off patterns of water courses; to increase the frequency of droughts and flooding, and to shift the patterns of agriculture, forests, precipitation and biological diversity. The rate of soil degradation is expected to rise as a result of warming, with a reduction in soil water storage capacity mainly in southern Europe. Studies of potential climate changes have led to predictions of a wetter climate in northern Europe and a drier climate in southern Europe. There is also the possibility of a recession of mountain glaciers and increased precipitation over parts of northern Europe. Changes in climate may also have a significant effect on the availability of freshwater and, in turn, hydrological changes can have a potential impact on climate (Figure 3). A recent report from the EEA showed that while emissions of carbon dioxide, the main greenhouse gas, decreased by 2 per cent between 1990 and 1994, there is considerable uncertainty whether the EU will meet the target of stabilising CO2 emissions at 1990 levels by 2000. Current measures are insufficient to prevent a further increase in CO2 emissions after 2000, when substantial reductions will be required. If future targets are to be achieved, accelerated remedial actions will be needed. Deterioration of water quality in Europe is caused by pollution from the three main sectors: agriculture, industry and households. Contamination arises from both point and diffuse sources: from accidents such as chemical spills, from storm run-off and from natural events such as volcanic eruptions. Water is also polluted by deposition from the long-range transboundary transportation of pollutants, often across national boundaries. The impacts of pollution are many and diverse but the general picture is one of deterioration in the ecological quality of aquatic systems, such as phosphorus induced eutrophication (which threatens biodiversity and tourism), and threats to human health and well-being from nitrates in drinking water, pathogens (associated with organic matter), pesticides and other hazardous substances. Water lying beneath more than 85 per cent of agricultural land in Europe, (at one metre depth in soil water), including central and eastern states, is estimated by model computations to exceed the EU guide level for nitrate concentration in drinking water (25 mg NO3/l). Nitrates are a potential health problem and may cause eutrophication. The Nitrates Directive (91/676/EEC) sought to reduce or prevent pollution of water resulting from the application and storage of inorganic fertiliser and manure on farm-land. There has been a marked decrease in recent years in the consumption of nitrogen fertilisers by the EU15 countries (Figure 4) although, according to data recorded by France, the United Kingdom and Denmark, nitrate concentrations in groundwater still appear to be rising (Figure 5). This is because of the long time lag between the use of nitrogen on land and its seeping into stocks of groundwater. 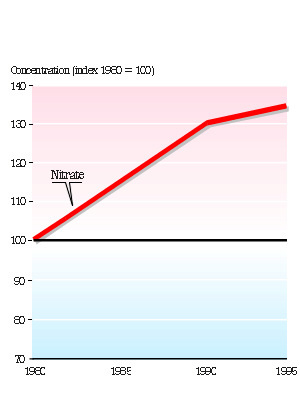 Nitrate concentrations also continue to rise in Europes large rivers (Figure 6). These influxes originate mainly from the intensification of agricultural practice, including high livestock densities and the application of animal slurry, as well as the use of nitrogenous fertilisers on farmland. NB: 5EAP92 and 5EAP95 indicate the targets set in the 5th environmental action programme in 1992 and 1995 respectively. It is likely that nitrate concentrations in both groundwater and rivers will get worse in many parts of Europe before reduced usage on land begins to affect levels in water. This puts further pressure on the clean supply of water and increases the urgency of improving efficiency of water use - another example of the links between water quality and quantity. Much of the excessive phosphorus loads to inland surface waters is attributable to discharges from municipal wastewater treatment plants, which have increased in recent years. In the northern countries of the EU, generally more than 80 per cent of the population is now connected to a sewer, while in the south, about 50 per cent is connected. However, more than 80 per cent of wastewater now receives secondary (biological) treatment, and this reduces the amount of phosphorus and organic matter in the effluent entering surface waters, thus improving water conditions (Figure 6). But the existing levels of phosphorus in surface waters (particularly from the continuing input from agriculture) are still too high to eliminate eutrophication problems in many European areas. The influence of the Urban Waste Water Treatment Directive (91/271/EEC) is also expected to result in further reductions of phosphorus and organic matter in surface waters in the EU. The presence of pesticides in groundwater is of increasing concern to both experts and the public. These compounds, of which there are around 50- 70,000 products with approximately 800 active ingredients registered for use in Europe, together with other persistent organic pollutants, such as PCBs, PAHs and dioxins, are produced by the chemical industry or result from combustion, coal mining or other industrial activities. They usually take a very long time to break down in natural waters, and are conveyed by atmospheric circulation or by water and sediment transport, eventually accumulating in the fat tissues of humans and animals. The fate of pesticides in water is extremely difficult to predict. Some computer models suggest that EU standards for pesticides in drinking water have been exceeded in some 75 per cent of total arable land in EU and EFTA countries (at 1 metre depth in soil water). This estimate is probably too high for groundwater (a 1992/3 survey in England and Wales found 96 per cent of sites monitored were in compliance with both EU and UK standards for 20 or so pesticides), but because of the slow transport of pollutants to the aquifer and inadequate monitoring, the true picture will not be known until better data become available. Although the use of pesticides is falling in EU countries (Figure 7), the long time lag between use and their levels in water means that, as with nitrates, the position could get worse before it can get better. 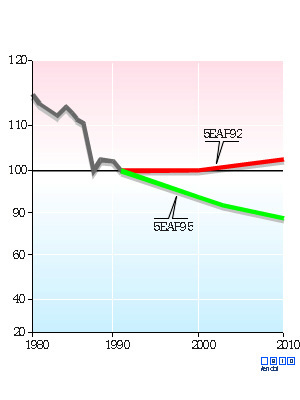 Surface water acidification has been of public concern since the early 1970s, when fish-kills in Norway and Sweden were attributed to "acid rain". Acidification, a consequence of the atmospheric emissions of sulphur and nitrogen oxides, and its impact on freshwater life, has been well documented over the last two decades. As a result of international co-operation on the reduction of sulphur and nitrogen oxides, the concept of "Critical Load" has been developed as the basis for establishing reduction strategies for atmospheric emissions. Although there is clear evidence that overall acid deposition has decreased (SO2 is down by 27 per cent from 1990 to 1994, and NOX by 10 per cent), the critical loads will still be exceeded in many of the more sensitive regions of Northern Europe. 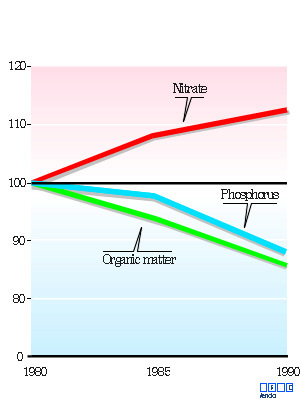 In agricultural areas, the use of nitrogen fertilisers may be a more important cause of acidification than atmospheric deposition, due to the conversion of nitrates (denitrification) in the soil. An adequate supply of safe water is vital to human health and survival. Sufficient quantities are needed for personal, domestic and industrial hygiene and represent an important contribution to the control of infectious diseases and promotion of social and economic development. Protecting the quality of drinking water, particularly from contamination by harmful organisms and chemicals is a pre-requisite for good health. The relatively recent identification of pathogens such as Giardia and Cryptosporidium transmitted through drinking water has directed attention to the potentially serious stomach illnesses they can cause. Microbiological contamination of bathing water, mainly in the Mediterranean, is estimated to result in over 2 million cases of gastrointestinal illness annually. Many chemicals found in water, such as hormonally active compounds (the so-called "gender bender" substances) and persistent organic pollutants, are under scrutiny even though their health impact remains to be fully investigated. Meanwhile, many people are responding to real or perceived problems of water quality by consuming bottled water at cost that could be more usefully directed to water quality improvements. For references, please go to https://www.eea.europa.eu/publications/92-9167-025-1/page003.html or scan the QR code.